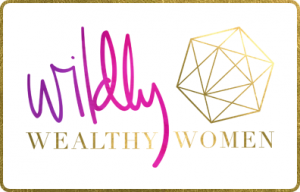 The Benefits of Op-Shopping – You’ll Love it! Being ethical and kind to the environment is so “in” right now, but we’ve been doing it for years. Buying clothes at the op shops cuts out the worry of whether or not it was made in a sweat shop. Buying second hand clothes and goods is recycling, keeping stuff out of the landfills. We interrupt the cycle of buy, use, throw away. The obvious one. Why buy brand-new clothes for hundreds of dollars when you can buy a whole new wardrobe for the cost of one of those brand-new clothes? Why buy brand-new clothes for your children that they grow out of in 6 months, when you can stock their drawers full of op-shop goodness for a quarter of the price? Why buy brand new items of furniture and home ware when the same things are available in the op shops where they are cheaper, built to last and have character? All the money you spend goes towards helping others less fortunate in your community. Some people suggest that op shop merchandise should be left for only the truly needy. 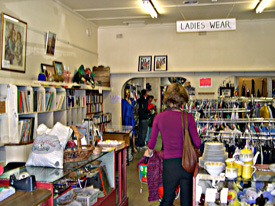 But this is not correct as op shops have tons of merchandise they need to move, so shopping there helps everyone out. seasons, and home wares with character and quirkiness. I have much more luck finding clothes I like for my boys there than in the mainstream stores. At any time, the average person can go to a store, find at least one item of clothing/shoes/homewares they like, buy it and take it home. Instant gratification, instant satisfaction. But how much satisfaction, really? Compare that experience to finding a brand new skirt at the op shop, still with its price tag of $39.99, for $5. Or patiently visiting the op shops every week until you find that perfect jacket that fits you beautifully, for a mere $8. Or finding some beautiful vintage wooden well-made toys for your children, for $1. I know which experience I would value more. previous owners. They’ve gone through the washing machine many a time, before ending up in the store. Therefore, you know that these clothes will not disintegrate in the first wash, or shrink. Clothes that have survived to make it to the op shop are generally of a better quality that your average sweatshop shrink-in-the-wash t-shirt. Browsing through every single item of clothing on the rack, looking for something that catches your eye. Flipping through every book in the children’s section. Coming back to the shop each week, patiently searching for treasures. And what a thrill when your patience is rewarded with a great find! And how much more do you value what you have been looking for, when gratification has been denied? Creativity is developed as you think of how to use your new finds, how to alter that dress, giving a new coat of paint to an old item of furniture, using old cards, pictures and buttons for your craft projects. You’re only limited by your imagination. Maybe you’ve never worn a shirt in that colour before. Or a dress in that style. Maybe you spy something you’d like to dye a different colour, or some furniture you could alter. Take the chance and see what happens! Unlike mainstream stores, if the experiment doesn’t work, you’re only out of pocket in gold coins. Op shops stores can potentially have anything. What kind of store has clothing, books, furniture, jewellry, knick knacks, all in the one place? Every option for the style you prefer can potentially be there for the finding. If you don’t like the current trend, go have a look in the op shop! Op shopping is like treasure hunting. You have the thrill of shopping without the guilt of maxing out the credit card. The anticipation of not knowing what lies inside, but it could be something wonderful….